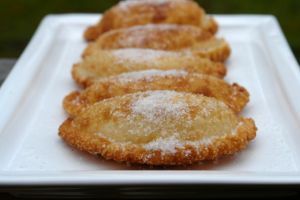 Apple Empanadas are a Venezuelan food recipe with apple stuffed pastries. Mix apples, sugar and cinnamon. Combine the cornstarch and the water in a small bowl. Spoon 1 tbsp. of the apple mixture onto the center of the wrapper. Moisten the edges of the wrapper with the cornstarch mixture and bring two opposite corners together to form a triangle. Pinch the edges to seal the wonton closed. Repeat with the remaining filling, wrappers, and cornstarch mixture. Remove the baking sheets from the oven and spray with cooking spray. 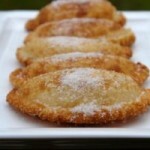 Place the empanadas in a single layer on the baking sheets. Bake for 8 minutes, or until golden brown, turning once.